"Chicago syndicate" redirects here. For other uses, see Chicago Syndicate. The Outfit did not have a monopoly on organized crime in Chicago, but was by far the most powerful, violent, and largest criminal organization in the Midwest. The Outfit's influence, at its peak, stretched as far as California and Florida. Higher law enforcement attention and general attrition has led to the Outfit's gradual decline since the late 20th century. From 1997 to 2018, the Chicago Outfit was believed to be led by John DiFronzo before his death. The early years of organized crime in Chicago, in the late 19th and early 20th centuries, were marked by the division of various street gangs controlling the South Side and North Side, as well as the Black Hand organizations of Little Italy. Big Jim Colosimo centralized control in the early 20th century. Colosimo was born in Calabria, Italy, in 1877, emigrating to Chicago in 1895 where he established himself as a criminal. By 1909, he was successful enough that he was encroaching on the criminal activity of the Black Hand organization. His expanding organization required the procurement of extra muscle. This came in the form of Colosimo's nephew Johnny Torrio from New York. In 1919, Torrio brought in Al Capone, thus providing Capone's entrance to Chicago. In time, Colosimo and Torrio had a falling out over Torrio's insistence that they expand into rum-running, which Colosimo staunchly opposed. In 1920, Colosimo was killed on Torrio's order. Torrio reportedly brought in New York colleague Frankie Yale to murder Colosimo. 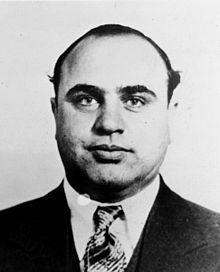 Al Capone has also been suspected as Colosimo's assassin. Torrio brought together different parts of Chicago criminal activity, with a lasting effect on Chicago in general, and Chicago crime in particular. With the start of Prohibition in the United States, Al Capone saw an opportunity for himself and the Outfit in Chicago to make money and to further expand their criminal empire by racketeering small businesses. With Capone taking the role of an actual businessman and partner of the owner, the Outfit had a legitimate way to source their money, which prevented incrimination and unnecessary attention from law enforcement. During the Prohibition era, Johnny Torrio competed with other gangsters in Chicago for the bootlegging business. Despite this, Torrio was able to reach a truce with Dean O'Banion, the leader of the Irish North Side Gang. The Chicago Outfit operated in South Chicago while Dean O'Banion operated out of the North Side. Torrio also had allied with the Sicilian Genna crime family that operated out of Little Italy in the city's center. The truce with the North Side fell apart and, on November 10, 1924, Dean O'Banion was killed by Frankie Yale and two Genna gunmen. Hymie Weiss took over the North Side Gang and, on January 24, 1925, Torrio was severely wounded in an assassination attempt. He recovered in the hospital, served a one-year jail sentence, and then handed off control to Capone and retired. In 1926, Capone had Hymie Weiss killed. Capone's accession led to a bloody war for control of the bootlegging rackets in Chicago during the 1920s. This culminated in the St. Valentine's Day Massacre. The war was widely covered by the press and turned Capone into a national figure. Capone and his men were raking in vast amounts of money, and were largely immune to prosecution because of witness intimidation and the bribing of city officials. He also paid off numerous police officers to avoid the arrest of his men. By the end of his reign, Capone had successfully expanded the Chicago Outfit throughout metro Chicago. One of the prime areas of interest was in Canada, the main source of alcohol which the Outfit was smuggling into the States. This illicit alcohol was then distributed to all the brothels of Chicago. During Prohibition, this was one of the greatest sources of income for the Outfit. The boss controlled the heads of various divisions of the Outfit through a system of subordinates placed throughout the various levels of the organization. Anyone who betrayed the honor of the organization was killed. Unable to convict Capone of any meaningful criminal activity, Treasury agents had him arrested for tax evasion and he was sentenced to 11 years in prison in 1931. Capone's hand-picked successor Frank Nitti nominally assumed power. In truth, power was seized by Nitti's underboss Paul Ricca, who was acknowledged as "boss" by the leaders of the growing National Crime Syndicate. Ricca ruled the Outfit, either in name or in fact, for the next 40 years. Over the next decade, The Outfit moved into labor racketeering, gambling, and loan sharking. Geographically, this was the period when Outfit muscle extended to Milwaukee and Madison, Wisconsin, Kansas City, and especially to Hollywood and other California cities, where The Outfit's extortion of labor unions gave it leverage over the motion picture industry. In the early 1940s, a handful of top Outfit leaders went to prison because they were found to be extorting Hollywood by controlling the unions that compose Hollywood's movie industry, and manipulating and misusing the Teamsters Central States Pension fund. In 1943, the Outfit was caught red-handed shaking down the Hollywood movie industry. Ricca wanted Nitti to take the fall. However, Nitti had found that he was claustrophobic, years earlier while in jail for 18 months (for tax evasion), and he decided to end his life rather than face more imprisonment for extorting Hollywood. Ricca then became the boss in name as well as in fact, with enforcement chief Tony Accardo as underboss—the start of a partnership that lasted for almost 30 years. Around this time, the Outfit began bringing in members of the Forty-Two Gang, a notoriously violent youth gang. Among them were Sam "Momo" Giancana, Sam "Mad Sam" DeStefano, Felix "Milwaukee Phil" Alderisio, and Fiore "Fifi" Buccieri. Ricca was sent to prison later in 1943 for his part in The Outfit plot to control Hollywood. He was sentenced to 10 years in prison, along with a number of other mobsters. Through the "magic" of political connections, the whole group of Outfit mobsters was released after three years, largely due to the efforts of Outfit "fixer" Murray "The Camel" Humphreys. Ricca could not associate with mobsters as a condition of his parole. Accardo nominally took power as boss, but actually shared power with Ricca, who continued behind the scenes as a senior consultant—one of the few instances of shared power in organized crime. Accardo joined Ricca in semi-retirement in 1957 due to some "heat" that he was getting from the IRS. From then on, Ricca and Accardo allowed several others to nominally serve as boss, such as Giancana, Alderisio, Joey Aiuppa, William "Willie Potatoes" Daddano, and Jackie "the Lackey" Cerone. Most of the front bosses originated from the Forty-Two Gang. However, no major business transactions took place without Ricca and Accardo's knowledge and approval, and certainly no "hits." By staying behind the scenes, Ricca and Accardo lasted far longer than Capone. Ricca died in 1972, leaving Accardo as the sole power behind the scenes. Along with the voting allegations, the Outfit was involved in a Central Intelligence Agency–Mafia collusion during Castro's overthrow of the Cuban government. In exchange for its help, the Outfit was to be given access to its former casinos if it helped overthrow Fidel Castro in Operation Mongoose or Operation Family Jewels. The Outfit failed in that endeavor and faced increasing indictments under the administration of President John F. Kennedy (JFK). The Outfit is the subject of some theories regarding the JFK assassination and that of JFK's brother Robert Kennedy. The Outfit reached the height of its power in the early 1960s. Accardo used the Teamsters pension fund, with the aid of Meyer Lansky, Sidney Korshak, and Jimmy Hoffa, to engage in massive money laundering through the Outfit's casinos. The 1970s and 1980s were a hard time for the Outfit, as law enforcement continued to penetrate the organization, spurred by poll-watching politicians. Off-track betting reduced bookmaking profits, and illicit casinos withered under competition from legitimate casinos. Activities such as auto theft and professional sports betting did not replace the lost profits. The Outfit controlled casinos in Las Vegas and "skimmed" millions of dollars over the course of several decades. Most recently, top mob figures have been found guilty of crimes dating back to as early as the mid-1960s. It has been rumored that the $2 million skimmed from the casinos in the Court case of 1986 was used to build the Old Neighborhood Italian American Club, the founder of which was Angelo J. "The Hook" LaPietra. Allen Dorfman, a key figure in the Outfit's money embezzlement operations, was investigated by the Department of Justice. In 1982, the FBI wire-tapped Dorfman's personal and company phone lines and was able to gather the evidence needed to convict Dorfman and several of his associates on attempts to bribe a state senator to get rid of the trucking industry rates. If Dorfman succeeded, the Outfit would have seen a huge gain of profit. This was known as Operation Pendorf and was a huge blow to the Chicago crime syndicate. Operation GAMBAT (GAMBling ATtorney) proved to be a crippling blow to the Outfit's tight grip on the Chicago political machine. Pat Marcy, a made man in the Outfit, ran the city's First Ward, which represented most of downtown Chicago. Marcy and company controlled the circuit courts from the 1950s until the late 1980s with the help of Alderman Fred Roti and Democratic Committeeman John D'Arco, Sr. Together, the First Ward fixed cases involving everything from minor traffic violations to murder. Attorney and First Ward associate Robert Cooley was one of the lawyers who represented many mafiosi and associates in which cases were fixed. As a trusted man within the First Ward, Cooley was asked to "take out" a city police officer. Cooley was also an addicted gambler and in debt, so he approached the U.S. Justice Department's Organized Crime Strike Force, declaring that he wanted to "destroy Marcy and the First Ward". Cooley was soon in touch with the FBI and began cooperating as a federal informant. Through the years, he maintained close ties to Marcy and the big shots of the First Ward. He wore an electronic surveillance device, recording valuable conversations at the notorious "First Ward Table", located at "Counselor's Row" across the street from Chicago City Hall. The results in Operation Gambat (Gambling Attorney) were convictions of 24 corrupt judges, lawyers, and cops. Accardo died in 1992. In a measure of how successfully he had managed to stay out of the limelight, he never spent a day in jail (or only spent one day, depending on the source) despite an arrest record dating to 1922. Chicago's transition from Accardo to the next generation of Outfit bosses has been more of an administrative change than a power struggle, distinct from the way that organized crime leadership transitions take place in New York City. Higher law enforcement investigations and general attrition led to the Outfit's gradual decline since the late 20th century. The Old Neighborhood Italian American Club is considered to be the hangout of Old Timers as they live out their golden years. The Club's founder was Angelo J. LaPietra "The Hook", who was the main Council at the time of his death in 1999. On April 25, 2005, the U.S. Department of Justice launched Operation Family Secrets, which indicted 14 Outfit members and associates under the Racketeer Influenced and Corrupt Organizations Act (RICO). U.S. District Court Judge James Zagel presided over the Family Secrets trial. The federal prosecutors were Mitchell A. Mars, T. Markus Funk, and John Scully. As of 2007, the Outfit's size is estimated to be 28 official members (composing its core group) and more than 100 associates. The Chicago Outfit was believed to be led by John DiFronzo (now deceased). Jim Distler (aka Jimmy Gambino) was released from federal prison in July 2015 after serving a sentence for money laundering, racketeering and bank fraud. Distler (Gambino) is an associate of the Chicago outfit crime syndicate and also has ties to the Russian mafia. Big Jim, Diamond Joe 1910 1920 Murdered on May 11, 1920. Papa Johnny, The Fox 1920 1925 Retired in 1925 after an assassination attempt. Al Brown, Scarface 1925 1931 Sentenced for tax evasion in 1931. The Enforcer 1931 1943 Committed suicide in 1943. The Waiter 1943 1947 Sentenced for extortion in 1943; stepped down in 1947. Joe Batters, Big Tuna 1947 1957 Stepped down in 1957, becoming a "shadow executive" of the mob. Mooney, Mo, Momo 1957 1966 Fled to Mexico to avoid imprisonment in 1966; deposed by Ricca and Accardo. Teets 1966 1967 Sentenced for violating the Hobbs Act in 1967. Milwaukee Phil 1967 1971 Sentenced for extortion in 1967-1969, deceased in 1971. Joey Doves, Joey O'Brien 1971 1986 Sentenced for skimming in 1986. Joe Nagall, Mr. Clean 1986 1989 Deceased from heart troubles in 1989. Sam Wings, Black Sam 1989 1996 Sentenced from racketeering in 1993-1994 and 1996, deceased in 1997. No Nose 1996 2014 Semi-retired in 2014, deceased from Alzheimer's disease in 2018. The street boss was a high-ranking member appointed to run the daily activities for the boss. The position was created to protect the boss from federal investigations. 1996–2007: James "Jimmy the Man" Marcello—sentenced in 2007, imprisoned for life in 2009. 1910–1920: John "Papa Johnny" Torrio—became boss in 1920. 1920–1925: Alphonse "Scarface Al" Capone—became boss in 1925. 1925–1931: Frank "The Enforcer" Nitti—became boss in 1931. 1931–1943: Louis "Little New York" Campagna—arrested in 1943, deceased in 1955. 1943–1947: Tony "Joe Batters" Accardo—became boss in 1947. 1947–1957: Salvatore "Mooney Sam" Giancana—became boss in 1957, murdered in 1975. 1957–1964: Frank "Strongy" Ferraro—died in 1964. 1964–1966: Samuel "Teets" Battaglia—became boss in 1966, deceased in 1973. 1967–1986: John "Jackie the Lackey" Cerone—imprisoned in 1986, deceased in 1996. 1986–1992: John "No Nose" DiFronzo—became boss in 1992. 1992–1996: James "Jimmy the Man" Marcello—became street boss in 1996. 1996–2006: Anthony "Little Tony" Zizzo—disappeared and probably murdered in 2006. 2006–2009: Joseph "Joe the Builder" Andriacchi—retired briefly due to illness. 1925–1928: Antonio "Tony the Scourge" Lombardo—murdered in 1928. 1928–1947: Charles "Trigger Happy" Fischetti—retired in 1947, deceased in 1951. 1947–1957: Paul "The Waiter" Ricca—retired in 1957, deceased in 1972. 1957–1992: Tony "Joe Batters" Accardo—deceased from natural causes in 1992. 1992–1999: Angelo J. LaPietra—deceased from natural causes in 1999. 1999–2007: Joseph "Joey the Clown" Lombardo—sentenced in 2007, imprisoned for life in 2009. 2007–2009: Alfonso "Al the Pizza Man" Tornabene—deceased in 2009. 2009–2016: Marco "The Mover" D'Amico—asked to step down so that Andriacchi could help advise the power shift from DiFronzo to DeLaurentis. Acting 2012–2016: Joseph "Joe the Builder" Andriacchi—retired in 2016. Elmwood Park – Peter DiFronzo – born in 1933. He is the younger brother of Chicago Outfit boss, John DiFronzo. In 1965, he was sentenced to 10 years in prison at Leavenworth Prison after he and 2 other Chicago Outfit affiliates robbed a warehouse in Forest View, Illinois of cigarettes, razor blades, and ladies hosiery. According to a report from an Illinois Gaming Board officer in 2005, DiFronzo and his brother John had obtained contracts through illegal payoffs and intimidation from a prosperous waste-hauling business in Chicago. Grand Avenue – Albert "Albie the Falcon" Vena – he was an associate of Gus Alex, a legendary Chicago Outfit political fixer. He has been active in the Outfit since at least the 1970s. On April 27, 1995, he was acquitted of the murder of drug dealer and associate Sam Taglia; authorities believe Vena shot Taglia twice in the head and then slit his throat over a money and drug dispute. He and Joe Andriacchi were suspected by the FBI of being involved in the disappearance of former underboss, Anthony Zizzo, in 2006. Robert "Bobby the Boxer" Salerno: Salerno was a former boxing trainer who knew Ernie Terrell very well. In 1995, he was sentenced to life in prison for murder, which he pleaded innocent to. Nicholas "Nick" Ferriola: he was sentenced for three years in federal prison for his role in the Family Secrets case. Ferriola is also involved in bookmaking all over Chicago. Michael "Handsome Mike" Talerico: he is related to Anglo LaPietra, and was a small-time bookie. Talerico was also once married to former Chicago Outfit hitman Frank Schweihs's daughter. Tony Saviano: during the 1980s, he was involved in an Outfit gambling operation. Pete Rose bet with his organization when in Chicago. Authorities speculate his nephew Tony Saviano out of West Chicago had great influence in the operation. Sam Sei: Sei and his nephew Keith had great influence in Melrose Park, Illinois and controlled the town after Rocky Infelice was convicted during the 1990s. Salvatore DeLaurentis ("Solly D"): He was sentenced to 18 years in federal prison in 1993 after he was convicted under racketeering, extortion, and tax fraud. Paul "the Indian" Schiro: he represented the Chicago Outfit in Arizona; mainly Phoenix and Maricopa County. Was sentenced to 20 years in prison during the Family Secrets trial. Robert Panozzo: A former member of the C-Notes street gang and soldier of the Grand Avenue crew. Was sentenced to 18 years on state racketeering charges on January 8, 2019. The Outfit is notable for having had other ethnic groups besides Italians as high-ranking associates since the family's earliest days. A prime example of this was Jake "Greasy Thumb" Guzik, who was the top "bagman" and "accountant" for decades until his death. He was a Polish Jew. Others were Murray Humphreys, who was of Welsh descent, and Ken Eto (aka Tokyo Joe), who was Japanese-American. Another well-known associate of the Outfit is Jewish New York City mobster Benjamin Siegel. Siegel was a childhood friend of Capone. Siegel's organization in Las Vegas and Los Angeles was an ally of the Outfit from 1933 to 1961, when the family boss, Mickey Cohen, was imprisoned and the family was decimated. The Chicago Outfit has a long history of portrayal in Hollywood as the subject of film and television. ^ "Phoenix 101: Underworld". Retrieved March 25, 2019. ^ "Chicago Outfit Chart 2010". Mobbedup.com. 11 February 2014. Archived from the original on February 21, 2014. ^ Ann Pistone; Chuck Goudie (July 27, 2009). "Aging bombing suspect linked to Outfit; Outlaws won't get out". Abclocal.go.com. Retrieved July 26, 2010. ^ "The Double O Alliance". WLS-TV. August 8, 2008. Retrieved January 29, 2015. ^ "Who's Who in Chicago Outfit for 1997 ISPN-97-10-12". Ipsn.org. Retrieved December 4, 2011. ^ Binder, John (2003). The Chicago Outfit. Arcadia Publishing. p. 9. ISBN 0738523267. ^ Hales, Taylor (January 4, 2018). "Organized Crime- How it was changed by Prohibition". University of Michigan. Retrieved January 4, 2018. ^ Binder, John (2003). The Chicago Outfit. Arcadia Publishing. p. 56. ISBN 0738523267. ^ Tisdall, Simon (June 26, 2007). "CIA conspired with mafia to kill Castro". The Guardian. Retrieved May 24, 2013. ^ "Retiring FBI Agent Recalls Bugging Role in Teamsters Case". tribunedigital-chicagotribune. Retrieved April 16, 2017. ^ Baumann, Edward (October 29, 1995). "FORMER FBI AGENT BILL ROEMER TAKES A LOOK AT MOB BOSS TONY ACCARDO". Chicago Tribune. Retrieved March 2, 2015. ^ a b c d e "American Gangland: The Chicago Outfit". Angelfire.com. February 10, 2014. Retrieved March 2, 2015. ^ a b "Chicago Mob State of The Union – Still Flying in 2015 – The Gangster Report". gangsterreport.com. Retrieved September 15, 2016. ^ "GR SOURCES: Chicago Outfit's 'Falcon' Flies To Street Boss Post, Vena Riding High Sans Handcuffs (For Now, At Least) – The Gangster Report". gangsterreport.com. Retrieved September 15, 2016. ^ "Moving Up….Again: D'Amico Back As Consigliere of Chicago Mafia – The Gangster Report". gangsterreport.com. Retrieved September 15, 2016. ^ "I-Team Report: Lunch with 'No Nose'". ABC Chicago. March 12, 2009. Retrieved December 31, 2017. ^ "United States of America, Plaintiff-appellee, v. Peter Difronzo and Medo Calzavara, Defendants-appellants.united States of America, Plaintiff-appellee, v. Anthony Daddino, Defendant-appellant, 345 F.2d 383 (7th Cir. 1965)". JUSTIA US LAW. Retrieved December 31, 2017. ^ "Firm with reputed mob ties flourishes". The Chicago Syndicate. Retrieved December 31, 2017. ^ "Mystery Remains After Acquittal in Melrose Park Murder". Maurice Possley. Chicago Tribune. April 28, 1995. Retrieved December 31, 2017. ^ "FBI seeks info 10 years after Chicago mob boss Anthony Zizzo vanished". Chuck Goudie. ABC Chicago. August 31, 2016. Retrieved December 31, 2017. ^ "Unmoved By Mobster's Plea, Judge Gives Him Life in Prison". Chicago Tribune. Retrieved February 2, 2013. ^ "Ferriola gets 3 years". Chicago Sun-Times. Archived from the original on October 12, 2012. Retrieved February 2, 2013. ^ "Chicago mob: From hit men to 'Wives'". Chicago Sun-Times. Retrieved February 2, 2013. ^ "Oak Brook Man, 9 Others Ran Gambling Empire, U.s. Charges". Chicago Tribune. Retrieved February 2, 2013. ^ "Lake County Mobster Gets 18 1/2-year Term". Chicago Tribune. Retrieved February 2, 2013. ^ Lambert, David (May 9, 2017). "The Scarface Mob". TV Shows on DVD. Archived from the original on May 12, 2017. Retrieved June 26, 2018. ^ Thomas P. Hunt; New Milford CT (23 October 1930). "The American Mafia – Joe Aiello". Onewal.com. Archived from the original on 27 November 2010. Retrieved 13 April 2011. Binder, John (2003). The Chicago Outfit. Arcadia Publishing. ISBN 0-7385-2326-7. Cooley, Robert (2004). When Corruption Was King: How I Helped the Mob Rule Chicago, Then Brought the Outfit Down. ISBN 0-7867-1583-9. Cooley, Will (2017). "Jim Crow Organized Crime: Black Chicago's Underground Economy in the Twentieth Century", in Building the Black Metropolis: African American Entrepreneurship in Chicago, Robert Weems and Jason Chambers, eds. Urbana: University of Illinois Press, 147–170. ISBN 978-0252082948. Lombardi, Mark; Richards, Robert Carleton & Hobbs, Judith Richards (2003). Mark Lombardi: Global Networks. Independent Curators. ISBN 0-916365-67-0. (Published for the traveling exhibition of Lombardi's work, Mark Lombardi Global Networks). Nolan, John Matthew. 2,543 Days: A History of the Hotel at the Grand Rapids Dam on the Wabash River. Russo, Gus (2002). The Outfit: The Role of Chicago's Underworld in the Shaping of Modern America. Bloomsbury USA. ISBN 1-58234-279-2.